Christmas is coming up! 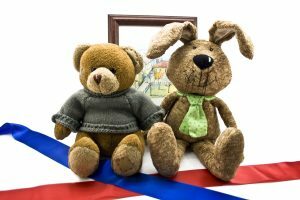 While the holiday season means more than just toys, most people look back on their childhoods with fond memories of a particular toy or stuffed animal that they loved very much. We have some very special books about the relationship between a child and their most favorite toy. 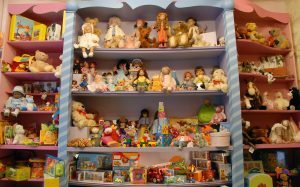 In this classic tale, a small stuffed bear waits to be purchased in a department store. Wanting to attract an owner, he ventures off of his shelf to find a button for his overalls. A young multicultural American boy loses his Bongo toy, but suspects it was stolen. He sets a trap to catch the thief. This tale is told with some Spanish words and includes a glossary at the back. Gramma gets Paige a balloon and makes her a stuffed bunny named Bun Bun Button. Paige ties the balloon to Bun Bun, and the balloon flies away with the bunny! Bun Bun Button takes a journey through the sky. Will she ever make it back to Gramma's? Readers will appreciate the bunny's facial expressions as the story moves along. Charlotte, a rough and tumble child, does not like dolls. 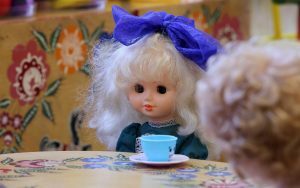 When she is gifted a delicate doll by her aunt, Charlotte sits the doll down and explains to her that she does not do tea parties. Can Charlotte accept this new companion? The Victorian illustrations in this book stand out for being extremely detailed. A little boy finds a velveteen rabbit in his stocking on Christmas morning. A toy horse in the nursery explains to the rabbit that he can become real if he becomes shabby and loved. The boy takes the rabbit everywhere with him and his rabbit sees real rabbits for the first time and wants to be like them. This is a longer and bittersweet, moving story for older children. It may make you cry happy tears. We also have a great toy book that adults will appreciate. This book of photographs details the stuffed animals of bygone childhoods that were loved so dearly.